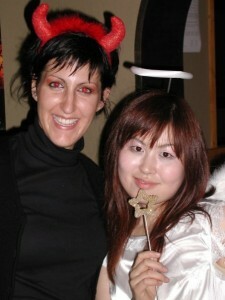 This year’s Halloween party will be held on Friday the 25th, starting from 7pm. As usual there will be live music, good food and fun, and special prizes for best costumes etc. This year’s band are Tim & Ginny from Nagoya, with a great mix of original songs and popular covers. The food is an all you can eat buffet, just help yourself! The are vegetarian friendly options as well. The bar will open at 7pm and beer and non-alcoholic drinks are all included in entry fee. Nomihoudai! Tickets are available in advance for 2000 yen, and on the day for 2500 yen. Time: 7pm until midnight. Last trains departing from JR Okazaki are 23:48 (to Toyohashi) and 23:17 (to Nagoya). Contact: Please use the facebook page, twitter, or call Declan.